4Videosoft DivX to DVD Converter is the best DivX to DVD Converter, which can create DIY DVD from the popular video files. Also, it can convert MPG, MPEG, MPEG2, MP4, MOV, M4V, MPV, MOD, MJPG, MJPEG, DAT ,etc. to DVD disc, DVD folder or ISO file. MPV, MOD, MJPG, MJPEG, DAT ,etc. to DVD disc, DVD folder or ISO file with high quality. 4Easysoft iPhone to Mac Transfer is the smart iPhone Music/movie to Mac Transfer to backup and transfer iPhone video/audio files to Mac local disk smoothly and easily without any loss. It also can transfer iPhone to iTunes. You are allowed to convert any videos to the iPhone MP4, MOV and M4V with the help of 4Videosoft iPhone Video Converter. It provides you with the powerful editing functions so that you can get a better video. 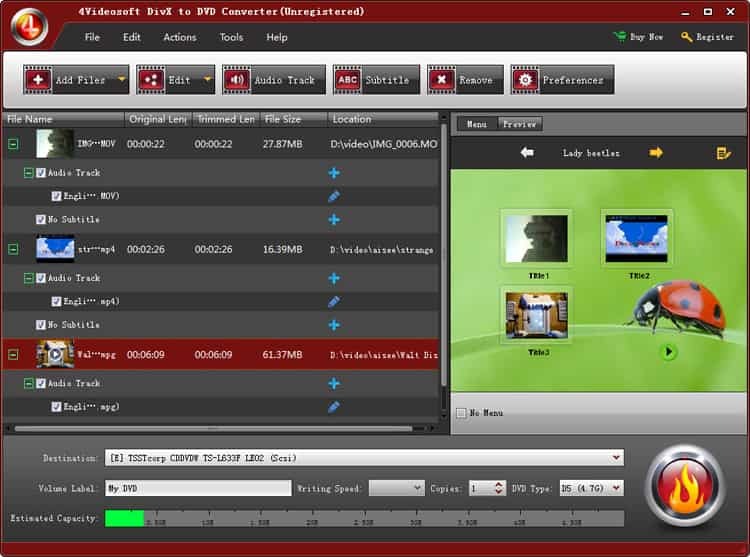 SWF video converter factory pro si automatical and powerful.Video formats such as AVI, MPEG, WMV, MKV, AVC, MPQ, MOVcan be converted into SWF (Flash Video) by SWF video Converter factory pro. 4Videosoft DPG Converter is a professional DPG movie converter, which can convert any video to DPG file, like MPEG to DPG, AVI, MP4, 3GP, VOB, etc. and HD video to DPG video, convert WMA, WAV, M4A, AAC, etc audio to MP3/MP2 for Nintendo DS.